This is the story of the project that failed. When I was at Microsoft one of the most valuable lessons I learned was that you learn more through failure than you do through success. Though the humiliating, soul-stomping and possibly career ending failures were not encouraged, I do have experience with this. So let's just say that I have learned a lot. Let's begin at the start of this project. I love layered desserts in Mason jars. I love craft projects in that there is a beginning, middle and end. When you finish a project, you feel good and you have something lovely for your home. 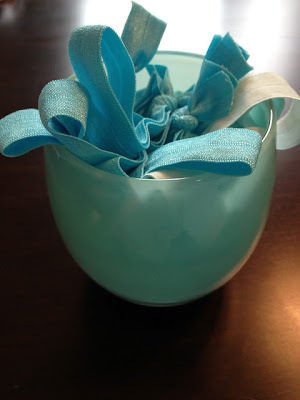 So I try craft projects and most of the time they turn out great like these elastic hair ties. Easy + rewarding. Then there are the projects like this one below that failed. You never hear about these. Well, now you have. I love the look of old Terracotta flower pots aged with moss positioned against a front door. I love the look of old copper pots with the aged aqua patina that looks like they belong in an old Italian villa. So I tried to make my own. I did research on how to age pots. I researched the perfect blue and green colors that would give the pots a faux aged appearance. I bought the Terracotta pots, BIG Terracotta pots. I stopped at four different craft and home improvement stores and bought the exact paints I wanted. And on a bright, beautiful sunny day a few weeks ago I started the project outside. I sprayed the pots with a blue base paint then copper paint to make them look, well, like copper. They dried. Then I sponge painted two different blues and wiped them off to age them appropriately. I finished off the project with a sealant spray. The pots turned out exactly as I hoped they would and I was pleased with the project. Then I visited six nurseries to find the right plants. 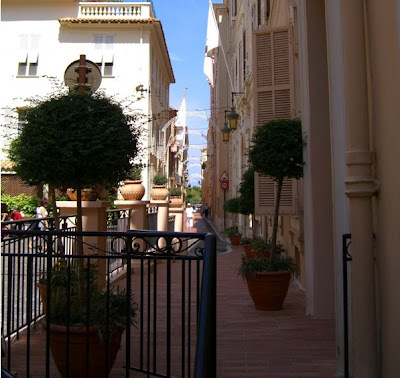 I thought perhaps a topiary like the ones above in Monaco. No, then fig? No. I settled on rosemary trees from Home Dept. I bought the best soil and planted the rosemary topiaries in my new pots. Lovely. Really lovely. Very Martha Stewart-like. I loved them. Terrific craft project. I was ready to post this project as a happy thing. Then one crisp, frosty, sunny morning I walked outside and saw some chips on the rim of the pots. I thought maybe someone bumped into them. I thought nothing more of it until two days later when big chips started to fall off the rim of the planters. I thought it was an anomaly. 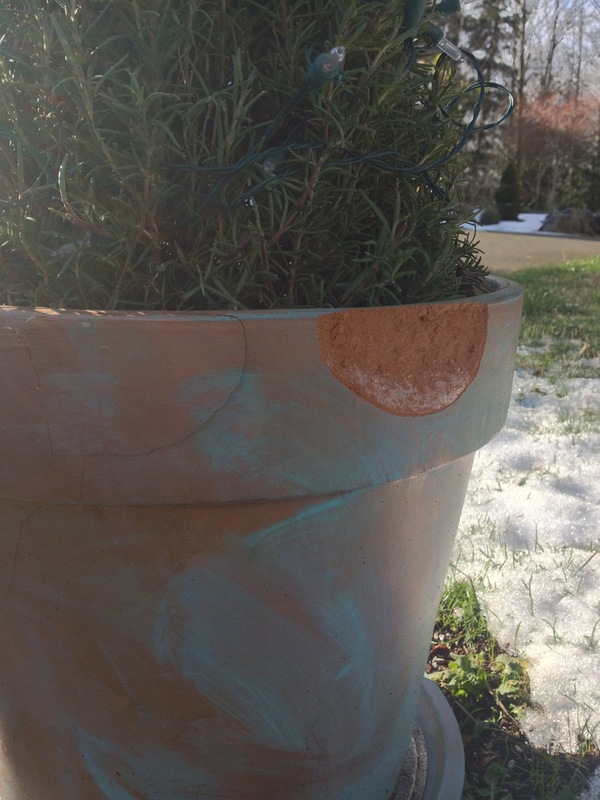 Yesterday was below freezing and I noticed huge cracks in the planters and clay chunks just falling off the pot. I did some research online and it turns out that when water gets into clay and freezes, it can crack the pot, which is exactly what it is doing. Little pieces falling off every day. Can it be salvaged? No, not really. I am going to wait until the weather gets in the 40's though and replant the rosemary trees into pots that have been glazed and treated. I'll smash the rest of the Terracotta though and use it in the garden as a decorative accent. The lesson here? There is always a lesson in life, right? One of the reasons I did this project was to save money. Sometimes it's just better to pay for something that's made well by someone who knows what they are doing. Don't believe everything you read. One beautiful glossy vase may have taken 25 tries to get it just perfect. If a project fails, you try to understand where the failure occurred and you start again. And you learn. With every single thing, you learn. Dont attempt this project. Final cost $147. The good news is now I'll have enough rosemary to flavor dinner for a long long time.